The truth behind 7 things you've probably been told about keeping horses healthy in cold weather. Whether you’re facing mounds of snow, frigid wind and ice, or just some dark and desolate months ahead, your winter horsekeeping routine will need some adjustments. Let’s tackle some common cold-weather horse care myths to help you provide the best management for your horse in the coming season. Myth 1: Blanketing makes your horse colder. False. Sure, many horses in many locations do not need a blanket in the winter. But then again, some horses do. The key is to blanket wisely. Here’s some help. If a horse is able to grow a heavy winter coat, this natural barrier helps insulate the horse by trapping air. However, this only works as long as the horse is dry. Additionally, this only works effectively if the horse is acclimated to cold weather, is healthy and at an adequate body condition score (BCS), and is consuming enough calories to maintain that BCS. If any of these conditions is not true, blanketing is the way to go. A clean, properly fitted blanket with thickness appropriate to the surrounding temperature should not make a horse colder simply because it is obliterating the air pockets created in a thick, natural winter coat. Insulation is insulation, be it by warmed air pockets or by an extra external layer of appropriate material. Choosing the right blanket is the next step. Blankets vary in warmth by their weight, or how much fill they contain. Typically a sheet has no fill and is the lightest blanketing option—ideal for protection from wind and rain, but offering little extra warmth in cold temperatures. The next level up is a medium weight blanket—this is most appropriate for moderately cold winters and for horses that need some protection. 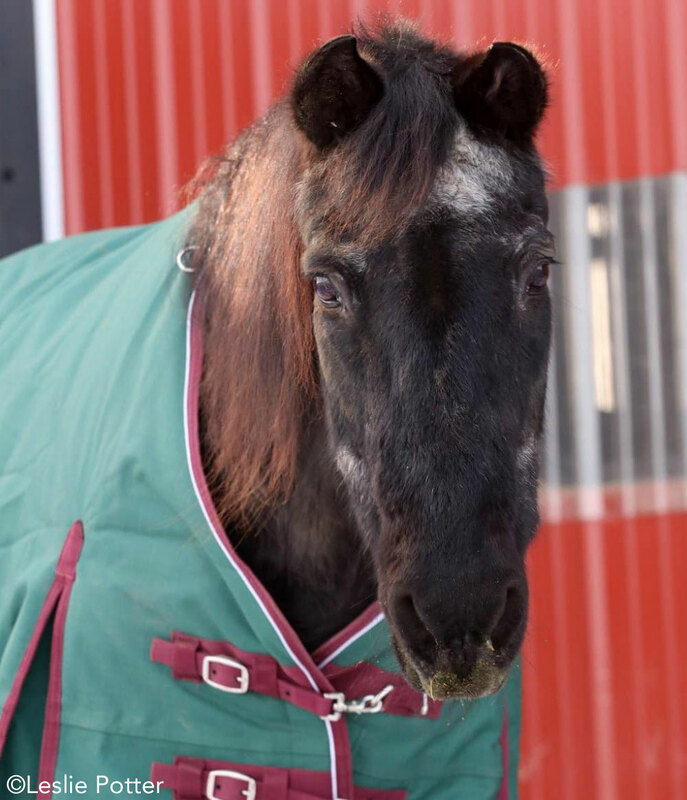 Heavyweight blankets provide the ultimate warmth for serious cold weather and horses with extra heat requirements, such as some senior horses, extremely thin or otherwise sickly horses, and those that have had a total body clip. All outdoor winter blankets should be waterproof and inspected regularly for damage. When spring arrives, clean and make repairs before storing in a dry, clean place. A brief word on ambient temperature: most horses prefer a cooler temperature than humans would find comfortable. Studies have shown that horses are most comfortable in temperatures ranging from approximately 20 to 60 degrees F.
Most healthy, unclipped horses can safely tolerate temperatures at or slightly above 0 degrees F—as long as there is no wind or precipitation. It’s helpful to keep this cooler mindset when determining whether blanketing is right for your horse and, if so, which blanket is best. Myth 2: Horses drink more water when the water is warm. True. Studies have shown that ponies will increase water consumption by up to 40 percent if their water is warmed, as compared to water just above freezing. While it is true that this is somewhat up to personal taste, the general guideline is that for maximum water consumption, water temperature should be between approximately 45 and 65 degrees F.
False. 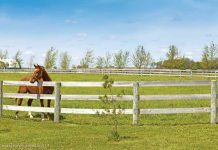 Air quality takes precedent when it comes to stalling your horse, and the winter season is no exception. When kept in a stall, urine ammonia fumes quickly rise no matter how frequently you muck, and this chemical is extremely harsh on your horse’s respiratory system. Older horses and those with respiratory disease such as RAO (heaves) are even more sensitive to this type of insult. Secondly, barns are dusty. Period. If you keep the doors and windows shut, dust particles (along with mites, mold, and other microscopic debris) expound and are on a direct inhaled flight right into your horse’s airways. Cue coughing, hacking, maybe some nasal discharge—the red carpet has been rolled out for respiratory issues. 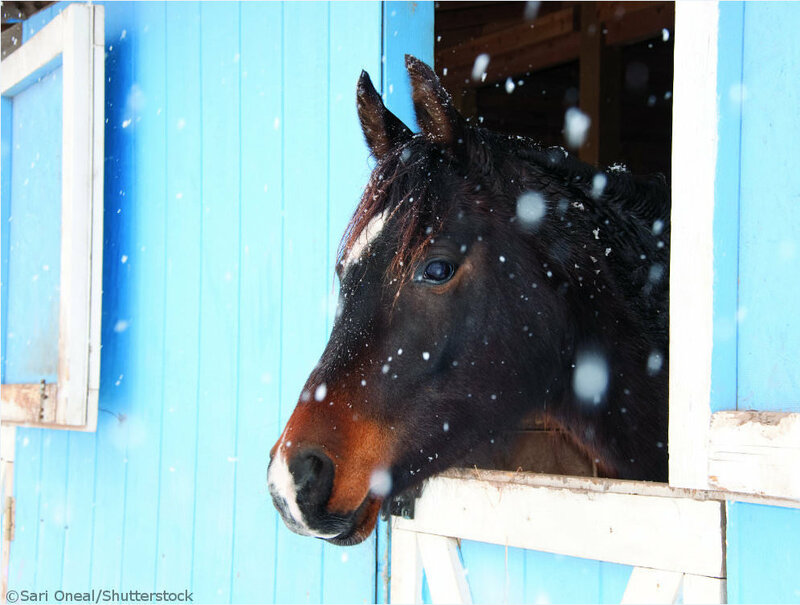 To avoid winter respiratory woes, keep those windows open to maintain ventilation, no matter how much the image of a snug horse in a warm stall might appeal to you. Myth 4: Keep your horses barefoot during the winter. \True-ish. Let’s talk physics for just a second. A bare horse hoof has better traction on snow and ice when compared to a typically shod hoof. Therefore, if your pasture and/or riding area is frequently snowy or iced, overall your horse will have a better grip barefoot. However, because there are so many different reasons why an individual horse may need shoes—hoof conformation, hoof health, the environment, how and where your horse is ridden in the winter, and where your horse is kept, just to name a few—it’s impossible to say which way is best for your horse. Generally, though, here are a few tips to keep in mind when deciding which way to go. Packed snow and ice can build up under your horse’s feet, and more so with shoes. This leads to uneven steps, sole bruises, and sometimes tendon and ligament injuries, not to mention slips due to decreased traction. During the winter, even when not riding, your horse’s hooves should be picked out at least once a day to prevent this build up. Daily hoof cleaning also helps prevent bacterial buildup and resultant maladies such as thrush and scratches. If your horse wears shoes, snow pads can prevent packed snow, and ice studs or a special application of tungsten carbide (commonly known by the brand name Borium) to the shoes can help increase traction on ice. Talk to your farrier if you think either of these may be right for your horse. Myth 5: A regular bran mash will keep your horse hydrated in the winter. False. But wouldn’t it be nice! This is not meant to belittle the bran mash, but it isn’t the cure-all to every equine condition. Here’s the scoop: in winter, most horses are consuming hay instead of pasture. Hay is usually less than 15 percent moisture versus grass, which is typically 60 to 80 percent moisture. Couple this with decreased water consumption in the colder months (see Myth No. 2) and your horse is primed for some amount of dehydration if you aren’t careful. Enter the bran mash. Yes, a nice warm mash is sloppy comfort food for your horse and many will gladly slurp it down. But when you consider that the average adult horse needs a minimum of 10 to 12 gallons of water a day, there’s no way a lowly bran mash can do all the heavy lifting. Where they typically end up helping is by increasing salt intake (most mashes contain some salt). The more salt a horse consumes, the more water he’ll drink. In short, bran mashes don’t hurt a horse in the winter, but they should not be relied upon to provide your horse with all his hydration needs. Appropriate water temperatures and daily access to a salt block are more beneficial when it comes to enticing your horse to drink. Myth 6: Your horse will get all the water he needs from the snow in the pasture. False! This one warrants an exclamation mark. Yes, wild Mustangs may get their winter water requirements mostly from snow pack. But this is a learned behavior and probably very heritable. Mustangs that don’t know this trick die, forfeiting their genes to those who do know the secret to survival in the winter. Most domestic horses will not intuitively consume enough snow to make up for their water requirements. If left to figure this out for themselves, they are at greatly increased risk of impaction colic and other dehydration-related issues. All horses should be offered adequate amounts of clean water during all seasons of the year for essential health and welfare. Myth 7: You should always warm a bit before placing it in your horse’s mouth. True. There’s no medical reason here; this is simply a matter of being a considerate person. Would you like a piece of ice cold metal in your mouth in December? Didn’t think so. Your horse will thank you.